Germany South of the Mayn. 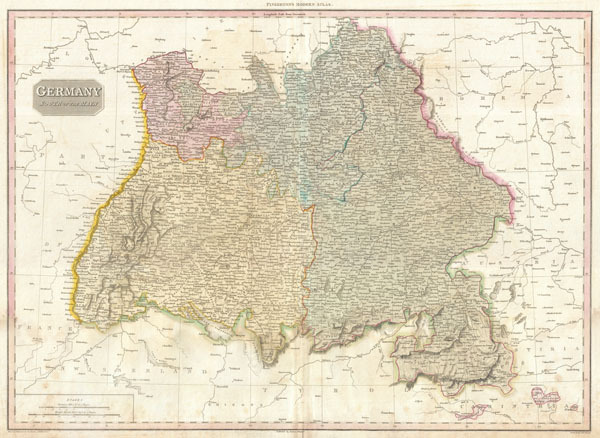 Pinkerton's extraordinary 1818 map of the southwestern part of Germany. Covers from the from Frankfort south to Lake Constance and east to Bishop. Includes the provinces of Swabia, Bavaria, and Franconia as well as parts of adjacent France, Switzerland, Austria and Bohemia. Offers considerable detail with political divisions and color coding at the regional level. Identifies cities, towns, castles, important battle sites, castles, swamps, mountains and river ways. Title plate in the upper left quadrant. Two mile scales, in German Miles and British Statute Miles, appear in the lower left quadrant. Drawn by L. Herbert and engraved by Samuel Neele under the direction of John Pinkerton. This map comes from the scarce American edition of Pinkerton's Modern Atlas, published by Thomas Dobson & Co. of Philadelphia in 1818. Pinkerton, J., A Modern Atlas, from the Latest and Best Authorities, Exhibiting the Various Divisions of the World with its chief Empires, Kingdoms, and States; in Sixty Maps, carefully reduced from the Largest and Most Authentic Sources. 1818, Philadelphia, Thomas Dobson Edition. Good condition. Mild damp staining in lower quadrants. Original centerfold exhibits some wear. Blank on verso. Rumsey 0732.029. Phillips (Atlases) 724. National Maritime Museum, 409.